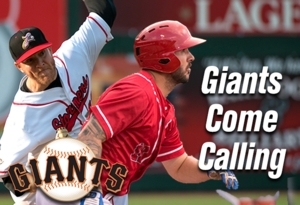 (Lancaster, Pa., June 28, 2017) - The San Francisco Giants have purchased the contracts of Lancaster Barnstormers first baseman K.C. Hobson and left-handed starting pitcher Nate Reed, it was announced today. Both are headed to San Francisco’s Class AA affiliate in Richmond, VA where they will join former Lancaster teammate Cody Hall, whose contract was purchased by the Giants earlier in the week, as well as Jerry Sands (Somerset) and Jarrett Martin (York) who performed in the Atlantic League earlier this season. Former Barnstormers’ infielder, Kyle Haines, is the manager of the Flying Squirrels. Hobson leaves with league leading totals of 21 home runs and 61 runs batted in, which put him on a pace for 46 homers and 133 RBI over the course of an entire season. He has homered eight times in the last ten games and 18 times in the last 45. He had two grand slams and three games in which he had driven home five or more runs, tying a franchise record. The lefty batter was also third in the league with a .326 batting average. Hobson first joined the Barnstormers on June 3, 2016. He finished fourth in the Atlantic League in batting (.320) and home runs (24) last season while finishing second in the league in slugging percentage. Reed was 2-4 for the Barnstormers as a rotation starter in 2017. He led the club with seven quality starts and was top in the rotation with a 3.53 ERA. In his final start with the Barnstormers, the Reading-area native fired the club’s only complete game of the season, a four-hit, 3-1 victory over the New Britain Bees. Reed fanned 12 in the outing, a season high by a Barnstormer and one shy of the franchise record. Major League teams have now purchased the contracts of seven Barnstormers in 2017, six in the month of June and four within the past 72 hours. The Lancaster Barnstormers are entering their thirteenth season as a member of the Atlantic League of Professional Baseball. Home games are played at Clipper Magazine Stadium in downtown Lancaster, Pennsylvania. Please call 717.509.HITS (4487) or visit www.lancasterbarnstormers.com for more information.